The Challenger Mine produced 66,216 ounces of gold for the year with an average milled grade of 3.91 grams per tonne (g/t), and a total cash cost of $1,107 per ounce. The Challenger Mine produced 66,216 ounces of gold for the year with an average milled grade of 3.91 grams per tonne (g/t), and a total cash cost of $1,107 per ounce. The grade was low due to a shortfall in ore supply from the mine that was supplemented by low grade ore from stockpiles. Higher dilution in stopes at the base of the mine and depletion on those levels due to the additional displacement of the ore horizons following the identification of the ‘215 Shear’, contributed to the lower than expected production from the lower levels. A shortfall in underground development also limited access to ore sources. Development and mining commenced at the higher grade Challenger West orebody during the year but was insufficient to offset the shortfall from the base of the mine. Because of the poor ore recovery from the bottom of the mine and the drop in the gold price, a strategic review of the mine operation was carried out. This resulted in a new plan that focuses on the higher grade Challenger West as the main ore supply. Ongoing improvements in site communications continued with the installation of a dedicated microwave link to the site. This greatly improves business communications and also allows our employees to communicate with their families from the accommodation village. Mine production for the year totalled 502,034 tonnes of ore at a reconciled grade of 4.17 g/t for 67,307 ounces. The M2 shoot ore source supplied 44% of total ore production at an average grade of 3.7 g/t. The M1 supplied 14% at 3.93 g/t and Challenger West was 32% at 5.68 g/t. Developing the high grade Challenger West shoot has continued to be the primary focus for the past and future 12 months whilst finishing M1 / M2 lodes at the base of the mine on the 155 and 135 levels. The year to date adjusted cash operating costs were $1,107 per ounce of gold. 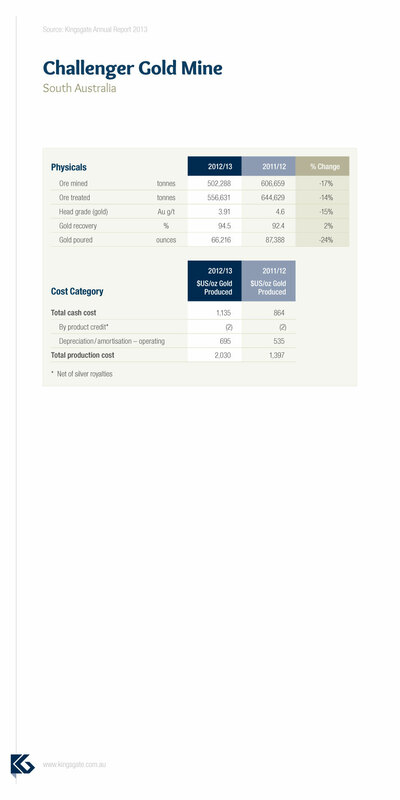 Total site operating cash costs were $67.5 million. Total cash expenditure including operating, capital and exploration was $140 million. 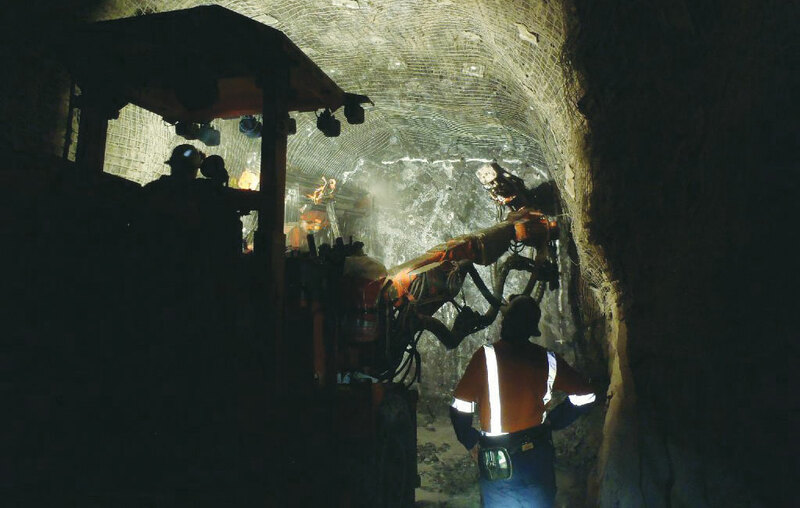 Capitalised expenditure for the mine was $57.5 million which included the main decline, level accesses, cross cuts, ventilation accesses, stockpile bays, and diamond drill drives along with electrical and de-watering stations. A total of $6.3 million was spent on numerous sustaining capital projects including a communications upgrade, excavator, various mill upgrades, and airstrip and access road upgrades. The mining contract with Leighton Contractors Pty Ltd ended in 2013. 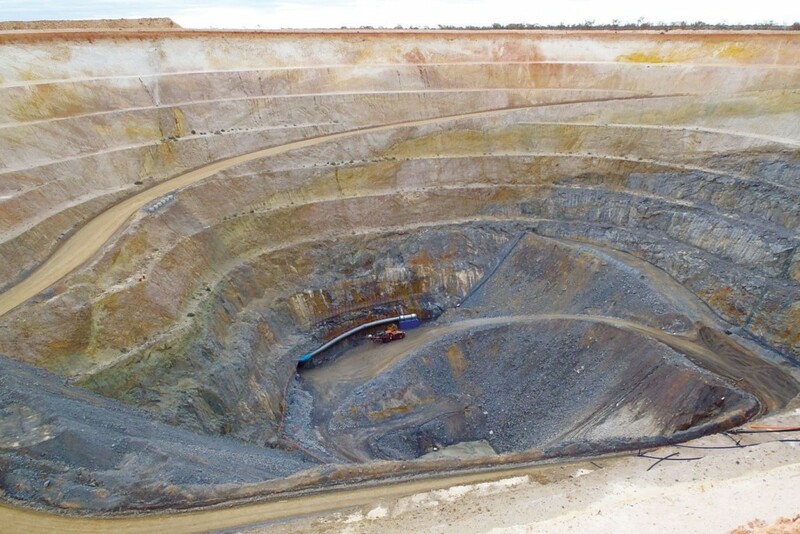 Following a tendering process, the new mining contract was awarded to Byrnecut Australia Pty Ltd, with the new mining contract commencing on 1 August 2013. 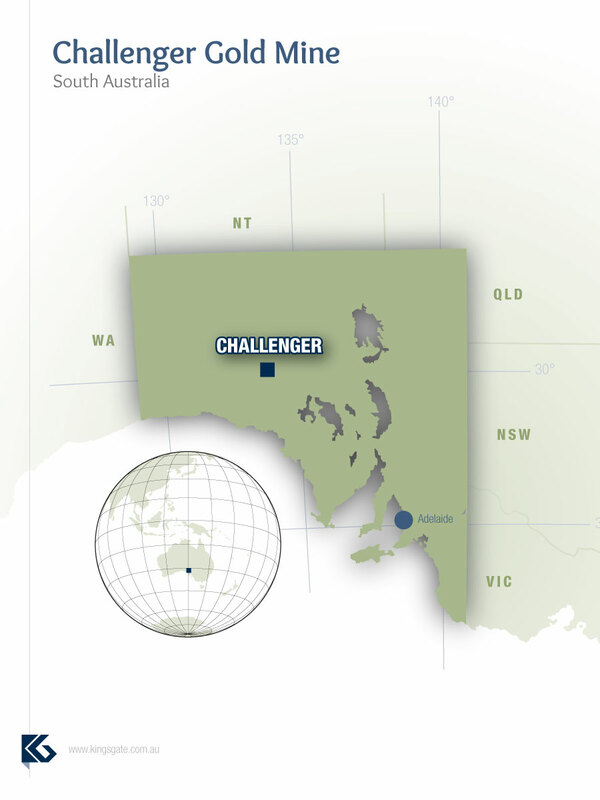 Significant geological milestones at Challenger for the year include the identification of the ‘215 Shear’, confirmation of M2 lode mineralisation below the ‘215’ Shear, and continued development on the high grade Challenger West lode. Development of the 215 level highlighted a moderate angle ductile brecciated zone dipping to the north west (termed the 215 Shear). This structure, rather than the ‘79’ Fault, has resulted in the offset in the lode system below the 215 level and this has been confirmed in re-examination of the drill core. Mining on various levels above and below the structure revealed it bisected the 79 Fault in a very similar position to where the lodes were truncated on a number of levels, and hence its significance wasn’t recognised for some time. Due to the orientation and moderate dip of the 215 Shear, the lodes were offset more than previously expected, and the immediate levels beneath, abutting the feature, had greatly reduced stope size. Development to test Challenger West orebody has been highly successful on the 790 and 810 levels, showing that the structure, while narrow and poddy, has good continuity along its strike length. Additional development on the 890, 870 and 650 levels has highlighted the structural variability of the lode down plunge. Considerable drilling has been undertaken to better define the Challenger West shoot and add to the resource. Mine production for the year totalled 502,034 tonnes of ore at a reconciled grade of 4.17 g/t comprising 356,009 tonnes at 5.26 g/t of high grade ore and 146,025 tonnes @1.52 g/t of low grade ore. The main M2 Lode provided 44% of mined ounces with 13% of ounces mined from M1. Compared to the previous financial year, M2 contributed a lower percentage of the total ounces mined due to increased contributions from the Challenger West. Challenger West Lode, which was mined for the first time in 2012, contributed an encouraging 32% of the total ounces. Ore production from the Main M2 and M1 lodes during the year was strongly impacted by the 215 Shear due to its foreshortening of the lodes in advance of the predicted ‘79’ fault. This resulted in less ore above the ‘79’ fault. The current decline and mining front of the M1/ M2 orebodies has continued below the 215 Shear, with the establishment of the 205, 195, 175, 155 and 135 levels. Stoping has been initiated on the 205, 195 and 175 levels where ground conditions in the stopes have led to greater than planned dilution. Poor ground conditions were noted in the levels just above the 215 Shear and are thought to be associated with the shear rather than with the depth of the mine. In an effort to control the dilution, stope dimensions, pillar placement and cable bolting is being trialled. A combination of these ground control methods has resulted in a degree of success in reducing the dilution. The mine schedule continued with a combined focus of development and stoping on two separate work areas being the high grade shoot at Challenger West on the 790, 810, 890 and 870 levels, and the mining of high grade ore pods below the 215 Shear on M1 and M2. A total of 6,799 metres of development was achieved for the year (exclusive of exploration). In April 2013, Kingsgate was saddened to report that an employee was fatally injured off site while returning home from the Challenger Gold Mine. It’s important to reflect for a moment to acknowledge the important contribution this individual made to his place of work but to also recognise the loss this person’s family suffers. Kingsgate is fully cognisant of the valuable contribution and dedication shown by this individual and will strive to ensure that his legacy is respectfully remembered. During 2013 there were four incidents resulting in lost time injuries, three restricted work injuries, and six medically treated injuries, an overall reduction of 48 percent on the previous year’s 25 recordable injuries. Total injuries reported have also decreased by 15 percent. There were no air medical evacuations during the year. The services provided by the OH & S team at Challenger include on-site emergency and clinical medical services for work related or private injuries, illness and counselling support services. Health programs delivered on site include health assessments and lifestyle promotional programs. The Health Centre has continued with the remote health care clinic in conjunction with the Royal Flying Doctor Service. This program has provided advice to assist personnel in managing private medical conditions and other health related topics. The site Emergency Management Team was involved in a large-scale exercise during the year that tested the team’s training and allowed the opportunity to review the site emergency management plan.